Benzinga - Feed Your Mind. Start a Free 14-day Trial. No Credit Card Required. Never miss breaking news that moves the market. Live squawk & custom alerts mean you're always one step ahead and you always know why your stocks move. Find stock picks with a precise screener. Whether it’s a $5 stock or a low-key gainer, you’ll find it first in Benzinga Pro. The News Feed in Benzinga Pro puts you ahead of the crowd with live updates from leading news sources — including market-moving exclusives from the Benzinga News Desk in Detroit, Michigan. Save time, energy, and screen space without missing a beat. Audio squawk streams live every day with breaking news and real-time market updates. Benzinga reporters provide inside access to executives, company insiders and analysts, so you can make better decisions — before the market moves. Search a fund's 13F holdings in real-time. See how much of each stock they own and track performance so you can make the same trades as legendary funds, like Berkshire Hathaway. "It costs roughly 15% of a Bloomberg terminal and... is both easy to use and sleek in design ... 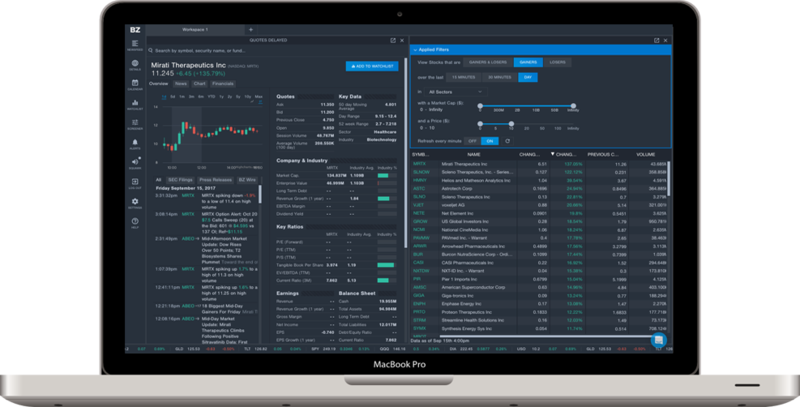 This platform offers immediate insight and a minute-by-minute breakdown of earnings reports, conference call points, stock ratings, takeover rumors and activist efforts. Traders who carry a routine will quickly discover that it’s easy to organize information, color code priority news sources, and engage the firm’s news desk." I use Benzinga everyday as part of my daily routine. I start by looking at stocks moving in the premarket on volume and then I look them up on Benzinga to see what the news is that is driving this activity. This keeps me informed on whats going on before the market opens. After the market opens I use the Audio Squawk for alerts on news driven moves and since Benzinga is so quick to get you the news you usually have enough time to get in before a big move takes place giving a huge edge on news that could have a large impact on the stock. "As many of you know I use Benzinga Pro everyday. Benzinga provides a real time news feed as headlines break on activist stakes, earnings releases, conference call key points, upgrades, downgrades, takeover rumors, the biggest market movers and plenty more actionable alerts. Charlie provides the radio commentary, and his calm voice and New York accent becomes part of your daily experience as a Day Trader ... Benzinga has a few competitors, most notable The Fly On The Wall and Trade The News. I have used both services, and found Benzinga to be the fastest to release breaking news." "This service is amazing. The interface is intuitive, the news is concise and relevant and the screener is gold." "You guys are the FIRST WITH NEWS!! You give me a head start on trades that would normally either be too late to enter or might even go unnoticed!! Thank you, Benzinga!" "Very complete info. Especially strong on option trading, which is a big deal with traders like me." log in to Benzinga Pro every day. Get started with the world's fastest and friendliest way to research stocks!